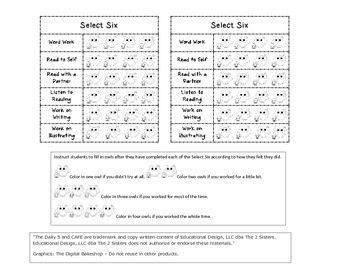 I use this rubric to help my students access their own on-task behavior during reading, as well as helping them switch tasks during reading in an organized way. The key helps each student evaluate and color in the correct number of owls based on their performance. "The Daily 5 and CAFE are trademark and copy written content of Educational Design, LLC dba The 2 Sisters. Educational Design, LLC dba The 2 Sisters does not authorize or endorse these materials."